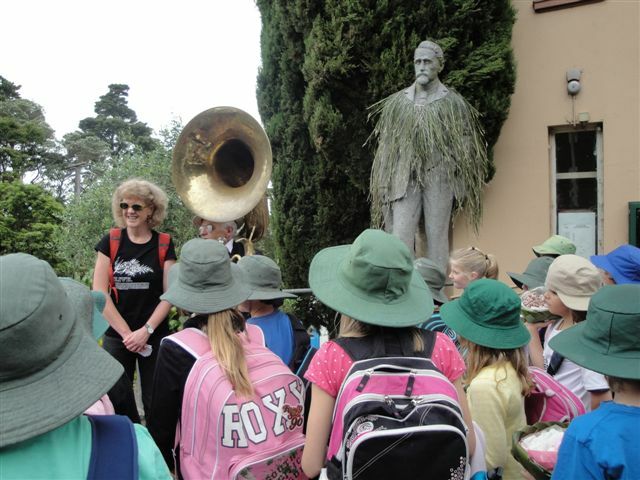 Fibre artist and Auckland Council Regional Parks Artist in Residence, Maureen Lander,Â led local school children and adults to a Hakari on Mt Atkinson to acknowledge giftor and benefactor Henry Atkinson who donated the hill with other land in 1914. Historically Atkinson’s statue stood on a plinth on top ofÂ the hill, but vandalism led toÂ the statueÂ being relocated to beside Lopdell House where he looks a little displaced. Meanwhile the plinth stands empty. Lander taught the children, staff from Auckland Botanic Gardens, Unitech student weavers, teachers, students and others how to weave and they made food baskets and mats. 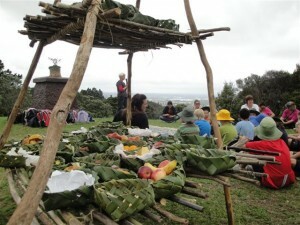 She had made a pyramid hakari stage on top of the hill and then the group ceremonially went in a hikoi up the hill. Everyone carried flax leaves which they used to create a green “Fringe of heaven” – meaning of Titirangi – near the summit. On the top of the hillÂ there were songs and dancing and everyoneÂ had a feastÂ and played games. Eru Thompson did the blessing and Riki Bennett provided traditional Maori music. Participants found the whole experience moving, but also good fun and a lot was learned in the process. Lander’s work will soon be exhibited at Lopdell House. See Events Calendar. The photos here are by Liz Marsh who is now working on a book about the Hakari.